"Creation is not merely an interesting idea. It is soul." Viewing a retrospective exhibition of paintings by Liu Dan might appear more like an international group show than the work of a single artist, as he effortlessly manoeuvres between numerous artistic styles and genres. Born in China, it was during the Cultural Revolution that the artist was first exposed to the work of Western artists in photographs taken by his friend of confiscated books. Intrigued by the images, Liu fastidiously copied the reproductions of Renaissance era drawings, even before Liu received any formal training in traditional Chinese painting techniques. This dichotomy of influences would take the artist in many different directions, from a modernist twist on traditional Chinese monochromatic landscape painting to a nearly photorealistic style of watercolor paintings of common, everyday objects. Driving this exploration, Liu was searching for a new discourse that could be both individual and unique, incorporating both the Eastern and Western artistic legacies he admired. 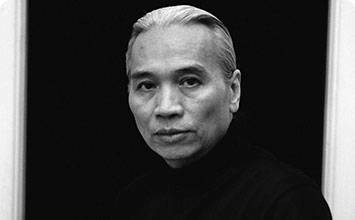 Yet despite the variety of artistic styles, Liu's artistic and philosophical goals remained consistent, as he sought to surpass superficial issues of style and instead capture the true essence of his subject. Liu Dan's painting style is not readily confined to any pre-existing category. Instead, the artist synthesizes influences from traditions normally held in opposition, the linear realism of traditional Western drawing and calligraphic legacy of Chinese ink painting. In doing so, Liu not only revitalizes the historic traditions of guohua, or native painting, but invents a distinctly contemporary manifestation of ink painting. Among his most acclaimed works are his intricate depictions of scholar-stones, based on a meditative and intense observation of the object. Liu describes the process as a "micro exploration through macro understanding." They are both scientific and spiritual, rendered in meticulous detail while embodying the Daoist principles of yin and yang energies, described by Chinese scholar Ah Cheng as "an open exploration of the connection between mind and Dao. Scholar's rocks are considered the quintessential expression of these two concepts." Coming of age during the era of the Cultural Revolution had deep psychological effects on Liu Dan, who has since described his pursuit of "true knowledge" as a core element of his artistic practice. This manifests most concretely in his monumentally scaled painting of a simple, timeworn Chinese dictionary published before the revolution took place. However, this passion is also evident in his continuous exploration of both style and subject, as he searches for the poetic space between what he describes as the realistic and abstract, or the rational and irrational, where the artist believes this truth exists. 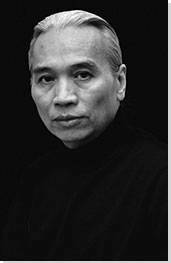 Liu Dan was born in 1953 in regional capital city of Nanjing, literally translating to the "Southern Capital," in the Jiangsu province of China. Liu's paternal ancestors were part of the wealthy scholar-official class during the Qing dynasty (1644-1912). The family later fell from their elevated position during the 19th century when the artist's great grandfather, who became addicted to opium, wasted the family's fortune and lost their standing in the Imperial court. Liu grew up with his parents, both teachers, three siblings, and his grandfather who instilled in the young boy a respect for China's cultural past, even while this legacy was actively suppressed in the socialist schools Liu attended. Beyond the Window is a page from a book collage series Liu Dan was developing in the mid 1980s, painted when Liu was 32 years old after settling in Honolulu with his wife. It depicts a traditional wooden shuttered window, realistically drawn in a Western style. The open window reveals an expansive open landscape rendered with scattered washes of gray and orange that defines rolling hills under a moody sky. The window is collaged on top of a dark black abstract form, possibly the frame of a bed or chair, that sits on the middle of the page, and in the far left corner, a portrait of a woman, drawn from an unusual perspective, is looking down into the viewer's eyes very attentively. For Liu, this was a time defined by artistic exploration. Alexandra Munroe, art scholar and critic, explains that "During his first years in Honolulu, Liu Dan experimented with fusing abstract brush-and-ink painting with realist drawing in a series of portraits and landscapes," of which this work is a prime example. Although, she adds, he hadn't yet solved the task of integrating "Chinese and Western, traditional and modern modes of expression on a deeper level, beyond surface imagery." The artist's choice of media and technique derived from his years of learning traditional Chinese calligraphy with his grandfather and studying historic painting styles at the Jiangsu Painting Academy. On the other hand, the incorporation of Western-style realism and use of linear perspective, reveal his intricate studies of the Renaissance drawings. The end result, with the odd combination of imagery and disjointed narrative is a slightly surreal composition, but clearly exemplifies his desire to reinterpret tradition and achieve a new visual language. Ink Handscroll, is a nearly 60-foot-long painting, depicting abstracted landscape forms, intertwined and unfolding across a traditional handscroll format. It is an example of the mature style that Liu first developed in the large-scale, multi-panel hanging scroll, titled Aceldama, completed a few years prior in 1987. The opening view into this formidable scene is dominated by red cinnabar hues bisected with a horizontal, cloud-like form suggesting a horizon line between the earth and heavens. The cacophony of forms, according to the artist, represents the "fiery origins of the universe." As the scroll opens, the red tones fade into grays and blacks, as Liu refines the palette to the archetypal monochromatic style of Chinese landscape painting. The brushwork, however, is anything but traditional; instead of using identifiable classical cun, or brushstrokes, the artist creates simplified shapes that suggest the influence of early 20th-century modernist experimentations, including the reductive forms of Cubism. The primordial landscape also departs from convention in the complete lack of any human presence throughout the composition. There are none of the typical signs of humanity, no recluse scholars, travelers, simple dwellings nor hidden temples residing in the lofty mountain peaks. Instead, the landscape is primal with abstract forms that merely suggest rather than resemble any natural settings. If, on the one hand, it can create associations with the creation of the world, on the other, the intricate details appeal to a more specific ongoing development of humanity, appearing to capture the movement of life itself. Tracing Liu's artistic lineage is difficult, as the artist is not limited to the powerful influences of guohua, but represents a multi-national dialogue between generations of monumental visionary landscape paintings from Asia, Europe and America. References can be made between Liu's Ink Handscroll to the twisting landscapes of Gou Xi, the famous Song Dynasty court painter, or the eccentric style of Ming loyalist Gong Xian, of the 16th century, who looked to nature rather than past masters as his guide. On this regard, Munroe suggests "Liu's refined brush technique creates a structurally ambiguous realm of light and dark, flat and refracted spaces which describe a majestic presence that is simultaneously solid and void." Equally compelling is the reductive simplification of form, suggesting the influence Georgia O'Keeffe, and the mannerist style of Thomas Hart Benton. Liu began work on the painting in 1989, a few months after the student-led demonstrations in Tiananmen Square were crushed by military intervention. In a public lecture at the Minneapolis Institute of Art, the artist recalled a moment of helplessness, staring in the light of a flickering candle, "Something magical happened. I saw that surrounding the light, the reality started moving, probably because of the heat, the light, but I caught that moment ... I caught the landscape combination. I was ready for new things, but I didn't know what until that moment happened." After a year of meticulous work, an all consuming process, the final result can be read as the artist's way to reckon with the violence of his own past and contribute through artistic tradition to instill beauty back into the world. While much of Liu Dan's oeuvre consists of large-scale paintings, the intimate drawing, titled Portrait of a Man, reveals much about the artist's Western influences. The paper upon which the drawing is crafted is less than five-by-seven inches, bringing the viewer into a close proximity with the subject: a close-up portrait, in profile, of a well-dressed man with clearly defined facial features, staring beyond the picture plane with an intense gaze. Although seeming to be drawn from life, the work is based on an old photograph of a Chinese-born, New York-based artist, Mu Xin then in his seventies, taken 20 years before the drawing was made. The style heralds back to the artist's youth, first learning to draw in the Western style from photographs taken of books destined to be consumed by flames in the rampant destruction of literature and historical texts during the Cultural Revolution. He learned to draw in the Western style from such photos, in a manner similar to which he created this work. Directly inspired by Renaissance red-chalk portrait drawings, Liu emulates the technique and materials with terracotta red chalk on worn ivory-toned paper. The marks on the pages, derived from the fact that it is a page from an old notebook, add to the overall vintage feel of the work. In this sense, a connection can be defined to a copied portrait of Leonardo da Vinci by an unknown artist from this period, similarly titled Portrait of a Man, which used similar materials and intensity of subject. The two gazes could meet, conceptually, as Mu Xin looks to the right and Leonardo looks left. On this regard, art writer and curator Michele Lim describes, "By transforming the likeness from photograph to sketch, the drawing has become an abstraction of the photograph, instead of the more conventional relationship where the photograph limits itself to a traditional handmaiden's role as the artist's visual notepad for an eventual painting." The use of a photograph as a reference point is also a stark contradiction from the techniques associated with traditional Chinese painting and reminds the viewer of the fundamentally different approach Liu takes, first blocking out his composition with an under drawing before the brush touches the paper. At first glance, this large-scale ink painting appears to be a highly meticulous rendering of the named specimen. To be more precise, the depicted flower with its dense, peony-like blooms references the Somniferum paeoniflorum or, more commonly, the Peony poppy which have strains related both to the production of opium and, more tamely, edible poppy seeds. The portrait is over seven-feet-tall, yet the flower has turned away from the viewer, evoking the Western notion that a poppy symbolizes death rather than its typical Chinese associations of loyalty, faith, and love. Liu created many similar drawings in this manner, taking both the poppy and the sunflower as his subject. Although less overt than his earlier work, there remains a clear dialogue between traditionally Eastern and Western styles in this painting. The classical materials are exploited by Liu, who pushes the media in new directions, inspired by his early exposure to Western art. Before applying the ink, unlike the Chinese ink painting tradition, Liu does a careful meticulous underdrawing in pencil. The work exemplifies the influence of his mentor, Ya Ming, who led him to admire both nature and traditional techniques. On this regard, art writer Michele Lim notes, "In the delicate edges of their petals and fur-shadowed stems, Liu Dan's poppies recall the beauty of Northern Song bird-and-flower court paintings in all their exquisite detail." Affinities might also be drawn to icons of the Western tradition. The scale and monumentality of the flower yields comparison with the refined modernist works of Georgia O'Keeffe, while the precise handling of the plants intricate structure suggest a prolonged study of the natural forms seen in Piet Mondrian's early sketches of flowers. In a similar manner, the work also bears resemblance to the series of flora and fauna by German renaissance artist Albrecht Dürer, which capture the profound delicacy and strength of the natural world. Dictionary is a large-scale, ink-and-watercolor work on paper, depicting an old Chinese dictionary in a highly realistic manner. Although the work looks nearly photorealistic, it is based on a previous preparatory drawing done in pencil, enlarged to an exaggerated scale, on three sheets of paper totaling 81-by-121 inches, using a grid system. The dictionary is opened in a way that the pages seem to be caught in motion. In the middle, a few pages stick together vertically, as if they have been captured in a delicate balance, revealing the text from nonconsecutive pages to the viewer. The dictionary's worn cloth cover, a flower pattern against bright blue and gold details, wraps around the book's casing. Although this example of Liu's paintings seems to verge on photorealism, the artist resists any such interpretations. Instead of emphasizing the mechanical precision of the camera, he describes such work as an interpretation of how an object is viewed through human eyes. The work reflects the artist's insatiable thirst for knowledge. In a 2010 interview with Asia Art Archive, Liu explains: "I found out the dictionary was made in Taiwan around 1937. I liked this dictionary because it was published before 1949. No communist-related content is present in the definition of the characters in the dictionary. It was pure in its explanations. ... It represents pure knowledge and to me is a key to acquiring knowledge." The script is composed of traditional Chinese characters, rather than the simplified Chinese promoted by Mao's regime. On one page, there are references to great historic figures, including legendary Tang Dynasty artist Wang Wei and the renowned calligrapher Wang Xizhi, while the other page contains a series of works listing, as the artist describes, "radicals that evoke water." Here Liu, who is also troubled by the highly commercialized nature of the contemporary art market, also describes the importance of choosing subjects with longevity. He continues, "This work portrays an institutionalized and cultural memory, not a fleeting social icon." Scholar-stones have a long tradition in various literary and court circles in China, where special specimens were collected and used to adorn gardens or the sides of lakes, representing a microcosm of the natural world and the dualistic energies of the Chinese cosmos. The stones within these gardens offered a miniature version, or microcosm, of the sacred mountains of the Daoist immortals and allowed those viewing the rocks to mentally travel to these often-distant locations. Contemplating drawings of the stones was also seen as a vehicle of psychological transport and spiritual meditation. The depiction of Scholar-stones in Chinese painting also has a legacy nearly as long as the subject of landscape, and the two subjects share much in common. As seen in earlier examples, magnification and scale are very much part of Liu's visual strategy. The work seen here is a sectional view of a standing stone accompanied by five lines of calligraphic script emphasizing the vertical dimensions of the drawing. Viewing ordinary objects from a unique perspective, Liu aims to create "a new angle to review the things people look at every day." However, his work is not merely about capturing the nuanced structure of the stone, but also an exploration of the metaphors the stones represent. "Liu Dan's embrace of Daoist philosophy is evident in his paintings of rocks," explains Yang Liu, curator of Chinese art at the Minneapolis Institute of Art in his essay titled To Make Stone Stony. "For example, the lengthy inscription in Peak of the Celestial Capital explains that the rock was from Yingde, a place designated in the ancient Daoist cosmological system as dongtian fudi (Grotto Heavens and Blessed Lands)." The actual peak of Mount Huangshan it is said to represent is 1,830 meters high, and its name "Celestial Capital" refers to the Daoist "capital of the immortals and the city of heaven." The unusual shapes of the aptly nicknamed "strange stones" are due to lengthy exposure to natural forces such as gravity, pressure and the erosive forces of water. Munroe describes, "As a hard, permanent substance that expresses constant change and transformation, the rock is the ultimate manifestation of the dualistic Chinese cosmos." It was often the case that the most bizarrely shaped stones were held in the highest esteem. Among the most prized stones are those dredged from the deep waters of Lake Taihu, located in the province of Jiangsu where Liu began his artistic training. Ironically, it was not this tradition that first led the artist to tackle this subject, but seeing the work of Georgia O'Keeffe in Hawaii, who's paintings of bones inspired him to look back to the popular subject from the Literati tradition. The ink drawing, featured at his first exhibition in Europe at the Eskenazi Gallery in London in 2015, is a large-scaled painting two meters in height and three meters in length. It portrays a sort of mystical landscape defined by rocks and other organic formations, that seem to allude to other forms, including an array of human figures, distant mountains, and intertwining vegetation. The work was inspired by the Raphael drawing Liu Dan owns, titled Saint Benedict Receiving Maurus and Placidus (c. 1503). What inspired him in the drawing was not the subject, but the rhythmic composition. For him, it is these preparatory drawings that define the real moment of creativity, the moment of "a private conversation between the artist and God." Liu then transforms the overall form and feeling of the drawing into a landscape, creating strong affinities and connections between the forms of the rocks and the human bodies in dialogue with one another, similar to what occurs in the Raphael drawing. Art historian Michael Goedhuis explains that "Liu Dan's ink paintings, whether of landscapes, scholar's rocks, or cypress trees, are all fastidiously conceived, complex works which highlight his concern to emphasize underlying compositional structure over virtuoso expressions of showy brushwork." Overall, the work aims to act as a sort of meditation, drawing the viewer's attention into the details while at the same time creating a link to a universal understanding of humanity. In his latest series, Liu Dan turns the tables once again with a new approach to a traditional subject. While the artist continues to work in the monumental style of monochromatic ink painting, he looks to classical Western painting as his source material. For this painting, the artist was invited to visit the Minneapolis Institute of Art and select a work from their collection as a starting point for his unique twist on landscape painting. As the artist was given a quick tour of the museum, en route to a room of drawings specially selected for this project, he was instead captivated by the dramatic depiction of Saint Paul and Saint Barnabas at Lystra (1636) by the Dutch artist Willem de Poorter on view in the European galleries. Although he discards much of the original work, the outline of the imaginary landscape remains indebted to the original Baroque painting while fragments of the figurative elements remain embedded in the weathered landscape. The distilled human forms create haunting imprints of the original narrative across the craggy cliffs, evoking the distorted forms of the hungry ghosts of Buddhist lore. Yang Liu describes, "he portrays distorted or monstrous characters, grotesque visages that subvert the classical narrative" of the Dutch painting. The dramatic tenebrism of de Poorter's painting provides another challenge for Liu to explore, one which represents a major departure from traditional renderings of the landscape in Chinese art and much of Liu's earlier work. Unlike the Western tradition, in traditional Chinese landscapes there are multiple views into the scene, sometimes referred to as "scatter perspective," as different elements are drawn as if viewed from different vantage points. Accordingly, the source of light is not singular, but spreads across the picture plane. Yang Liu explains, "Since a consistent light source is never visible in classical Chinese landscape painting, he has broken with tradition to create an unparalleled type of ink landscape not derived from prototypes."